It was a lofty goal: to set up, organize and hold three events to coincide with World Refugee Day on June 20, 2018. 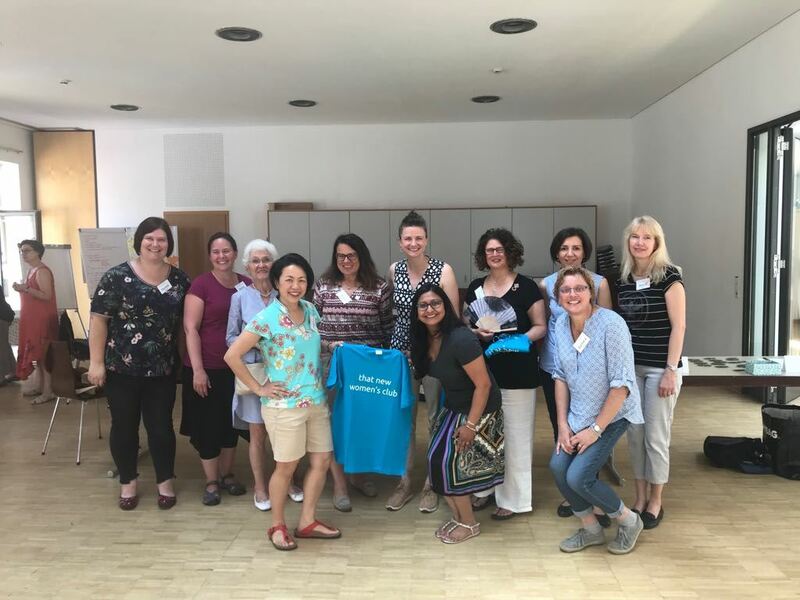 But President and Founder, Christine Funke, wanted a way to show that working with refugees is an important issue for the Heidelberg International Women’s Club. Along with raising awareness and talking about these events, and therefore this issue, the Club raised €260 for the FAWCO Target Project, Hope Beyond Displacement! Taken together, these events show the diversity of the membership of the club, the interests of the members, and the strength of working together to get things done. Through a book discussion, a party with refugee women, and a challenging walk through the middle of the night, the HIWC is committing ourselves to supporting refugees living in our community and around the world. Additionally, the HIWC joined FAWCO in supporting the FAWCO Target Project in considering that many of us chose to leave our home countries, but what if we had no choice? This meant that the HIWC was taking part in in a larger, global-wide campaign through our FAWCO membership to fundraise for the Target Project on World Refugee Day. 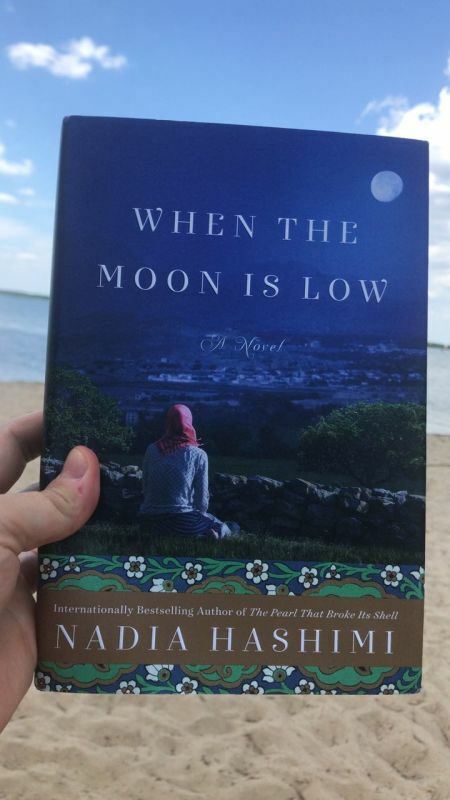 Through FAWCO membership and connections, Christine was able to get in touch Nadia Hashimi, the author of the book When the Moon is Low, a fictional story of a woman who must flee Afghanistan with her children to get away from the Taliban. Nadia had spoken with other FAWCO Clubs in the past, and was willing to speak with a group of HIWC Members who gathered at Christine’s home after reading the book. The book discussion was engaging but getting the chance to chat with the author herself was amazing! She was thoughtful, kind, funny and in the middle of a U.S. congressional primary campaign, but still had time to speak with us. She gave us insight into how she created the characters, how she wanted to create situations that she thought couldn’t possibly happen in the journey of a refugee from Afghanistan to England, but do happen now. She answered our questions and impressed us with her candor and approachability. It really was a special moment for the members who attended this event, and those avid readers who have been part of the Book Club for a few years. 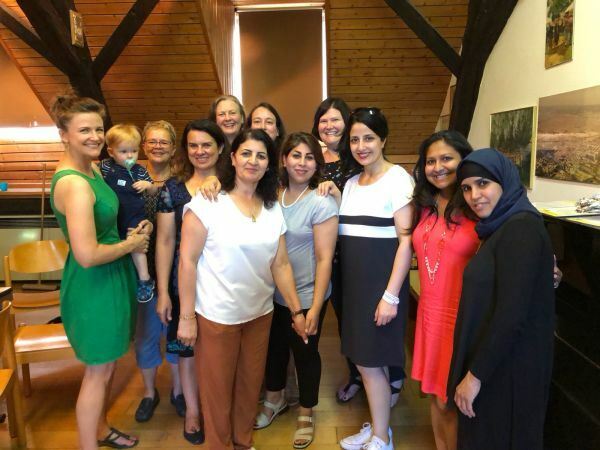 Originally a picnic on the Neckarwiese had been planned for the afternoon on June 20, World Refugee Day, but due to logistics and timing, a few HIWC members went out to Freinsheim, a small town in the Pfalz, about 40 minutes away from Heidelberg. The Zuckerfest (sugar party) celebrated the end of Ramadan and everyone brought a dish to share. The organizers of the Frauentreff (women’s get together) spoke and welcomed everyone, and translations in Arabic and Persian were given as well. Lots of small children ran around the room and everyone enjoyed the food. The Club continues to keep in touch with the group, Miteinander in der VG Freinsheim, who spoke at the January Monthly Meeting. 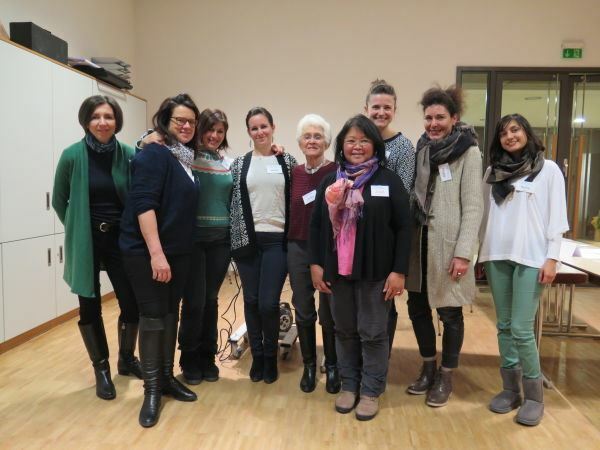 We hope they’ll be a good resource as we continue to work with refugee women in Heidelberg and that the groups can support each other in various ways. The series of events wrapped up with an hour walk starting at midnight along the Neckar River in Heidelberg. Modeled off of “The Night of the Refugee” held in The Netherlands, this walk was purposefully challenging to help us understand a bit better what it might be like to have to walk at night to leave your home and go somewhere unknown. While, we can’t ever recreate or fully understand what that might be like, the women who participated appreciated the chance to walk and talk and discuss ways for the Club to continue to develop our charity and volunteer work. We got a selfie on the Theodor Heuss Bridge with a clear view of the moon to remember our first Walk Through the Night. Overall, it was a successful series of events and we’re happy to have supported the FAWCO Target Project, Hope Beyond Displacement, with a donation, as well as, talked about this issue with our new Club. We can imagine that each year we’ll want to continue to use World Refugee Day to raise awareness, do some activities together, and fundraise for the refugee projects that are meaningful to us. 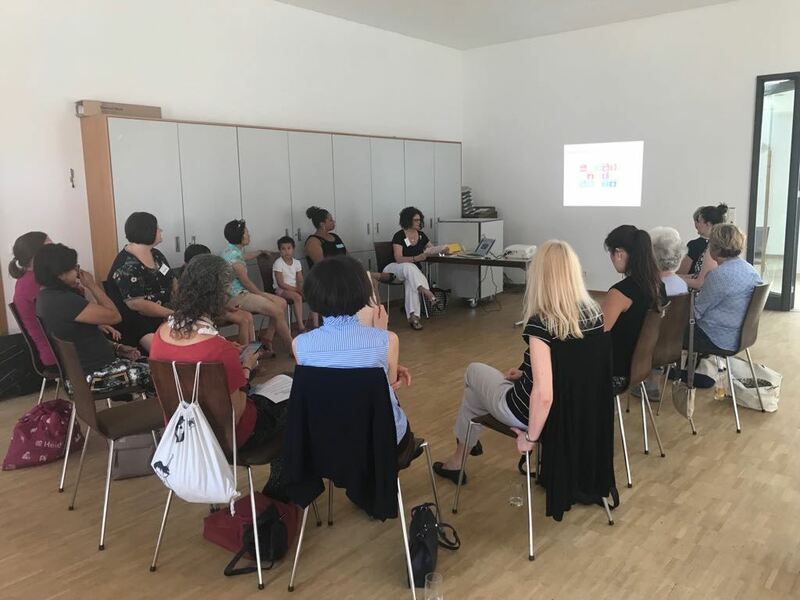 On a very warm morning at the end of May, around 17 women attended our Monthly Meeting at the Peace Church Community Room in Heidelberg-Handschuhsheim. Our guest was Tricia R Saur, an HIWC Member, AIWC Cologne Member and FAWCO Target Program Chair. This morning gave HIWC members and guests a short introduction to FAWCO (we joined in April) but mostly Tricia focused on the Target Program and the Target Project, Hope Beyond Displacement. Tricia started with the history of the Target Program, where it began with raising money for mosquito nets then water wells in Cambodia then bras for women to sell to fight human trafficking and now supporting the education and skills training for refugee women and girls in Jordan. Hope Beyond Displacement (HBD), the Target Project submitted by Therese Hartwell, a FAUSA Member, and voted on by the 65 other FAWCO Member Clubs, is a project by Collateral Repair Project (CRP) in Amman, Jordan. They support refugees from various backgrounds and countries who do not live in camps but are not legally allowed to work. Through HBD, the Member Clubs can collectively fundraise and support educational and skills training programs for the refugee women and girls they work with. Programs include beautician skills training, Super Girls, a program for young girls to work through the trauma of war and hardship, international driver’s license training, providing school uniforms and materials to girls going to school, and gender-based violence training for women and men. Additionally, many of the programs then train new trainers who will be able to deliver the programs and provide the element of sustainability to CRP’s programs. Tricia shared that the original fundraising goal of $125,000 for HBD has already been met, with another 8 months of fundraising still to go! Also, in early April a group of 22 women from FAWCO and FAUSA joined a site visit to Jordan and CRP to learn more about the organization, to see the programs in action, and to meet some of the people the Target Program is supporting. Tricia shared testimonials and photos which brought the visit to life for our attendees. After her talk, there were some questions and a discussion, and Tricia also sold items from the Backing Women Boutique, the fundraising campaign to support the Target Project. Beautiful, handheld fans were the popular item with the hot temperatures. We were very excited to learn more about the Target Project, as the HIWC has some fundraising events coming up in June which will be raising money for Hope Beyond Displacement. Additionally in December the HIWC will have a Benefit Concert featuring the talented Robin Meloy Goldsby, which will raise money for the Target Project. Thank you Tricia for your inspiring and informative talk! We have officially joined FAWCO as the 66th and newest Member Club. This gives us an intimate connection to 65 other women's clubs and associations around the world therefore expanding our "community" to reach across the globe. We are thrilled to be a Member Club of this inspiring organization. Founded in 1931, FAWCO is an international network of independent volunteer clubs and associations comprising 65 member clubs in 34 countries worldwide, with a total membership of around 10,000. FAWCO serves as a resource and a voice for its members; seeks to improve the lives of women and girls worldwide, especially in the areas of human rights, health, education and the environment; advocates for the rights of U.S. citizens overseas; contributes to the global community through its Teams and The FAWCO Foundation, which provides development grants and education awards. The organization is a global women’s NGO (non-governmental organization), and since 1997, FAWCO has held special consultative status with the UN Economic and Social Council. As a Member Club, we can attend yearly conferences and regional meetings, have access to online resources, the best practices library, education awards and development grants, fundraise for causes we care about on a global scale, and much more. Our members now can volunteer in FAWCO positions, and we're happy to announce the Heidelberg IWC is going to be hosting the Region 5 Meeting from November 9 - 11, 2018! This is an important milestone for our Club and we can't wait to get more involved with this dynamic organization! 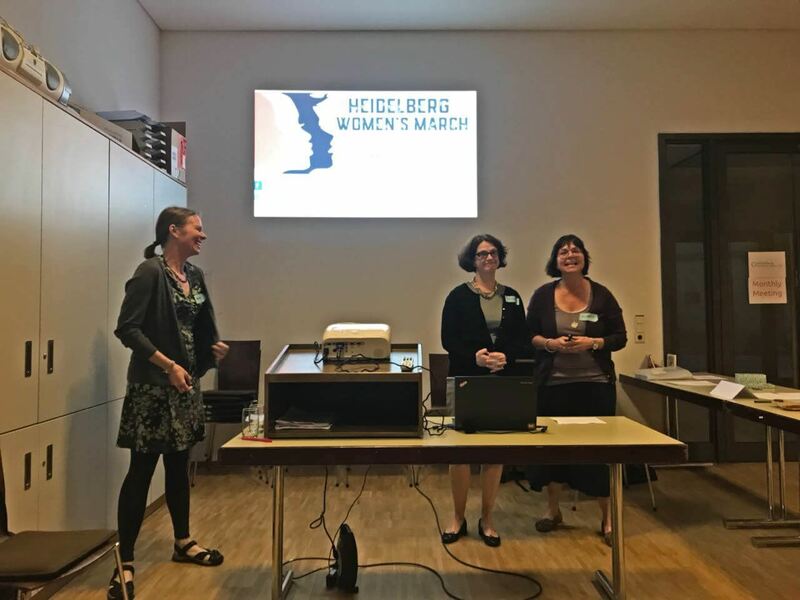 The fourth Monthly Meeting of the Heidelberg IWC took place in an April evening and featured the founders of the Heidelberg Women's March, Dr. Kristen Nawrotzki, Melisa Jaenisch and Veronika Froehlich, as our guest speakers. Around 20 people joined the Meeting to get updates on Club news, to network and to hear the speakers. Vice President Laura Bobanovic opened and led the Meeting and then handed over the spotlight to the three dynamic women. Kristen, Melisa and Veronika each shared their own story of how they got involved with the Women's March. Kristen, for example, talked about her state of shock at Trump's win for the U.S. Presidency, and they all agreed that while they couldn't attend the Women's March in Washington, D.C., they felt that their home country of Germany needed them to stand up, turn feelings in action and organize their own Women's March in Heidelberg. Getting going took a lot of work: from getting permission from the city and reaching out to people and marketing the event, to having to change the route due to the large number of people expected to attend. So, on January 20th, 2017 they walked with close to 1,000 women, men and children from Friedrich-Ebert-Platz to Marktplatz in Heidelberg. Many attendees expressed their gratitude to be able to express their feelings through the march. 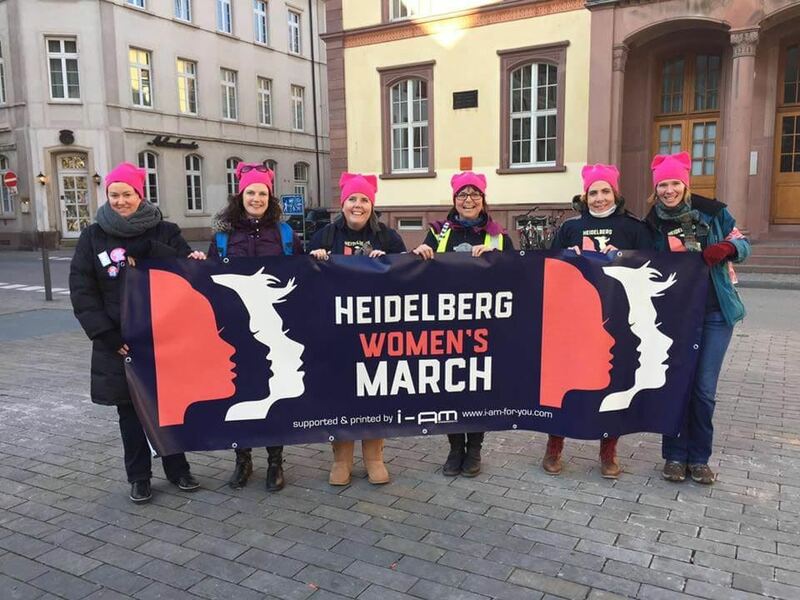 In 2018, they organized the 2nd Heidelberg Women's March with around 500 - 800 people attending. They've also helped organized other demonstrations including "Stand with Standing Rock" and "March for Science." They organize a Huddle once a month to keep in touch with women from various organizations who want to talk and raise awareness about different issues affecting women. You can also join the Huddle online through a medium designed for exchange, mentorship and support among local activists. Look for the "Heidelberg Huddle" group on Facebook and ask to join; curiosity is enough, no commitment or expertise required! Additionally, Melisa has started an initiative to remove gender labels from the public libraries in Heidelberg, which you can follow on Facebook on the page "Stop Genderlabeling of Books at the Heidelberg City Library". While those labeled books still exist, their numbers are decreasing. After their talk, there was a lively discussion among the guest speakers and the attendees, which concluded around 22:00 that night! We say a big thank you to Kristen, Melisa and Veronika for joining us and inspiring us to speak up and take action when we want to see change. Inspired to join the Women's March organizers or just want to stay up to date on their activities? Check out and like their Facebook page @HDWomensMarch or email them at hdwomensmarch@gmail.com. This week, the members of the Heidelberg IWC joined together to make history for the Club. The EGM was opened by HIWC Founder and EGM Chairwoman Christine Funke. Attendance was taken with 10 members attending and directly after the voting started. On all three items, the votes were unanimous in support and 2 write-in ballots were also noted. A celebratory feeling filled the room; it was an exciting day for the Club! Later on Wednesday, March 21st, 8 members met at a notary’s office in Heidelberg’s Old Town to sign the Constitution as part of the application to become an official association (Verein). The three newly elected Board members, Christine Funke, Laura Bobanovic and Barbara Bellosa, signed the application form, and it’ll be sent to the District Court of Mannheim for processing. With a lot of work done to prepare for this week, the Heidelberg IWC is in a good position to becoming an official charitable association, so that it can operate legally and take care of its members and others in the community. The Monthly Meeting on March 19th was a bit of a special one in the Heidelberg IWC’s (short) history. Along with the usual Meeting agenda (chatting, Club updates and a guest speaker), the Members held an Extraordinary General Meeting to vote on the Constitution, the Executive Board and to join FAWCO. Read more about the EGM and the HIWC making history. After the EGM finished, Founder and newly-elected President Christine Funke gave the Club updates, mostly about upcoming events. After that, the group of 14 took a break before guest speaker, Jenny Ciucci, began her talk. 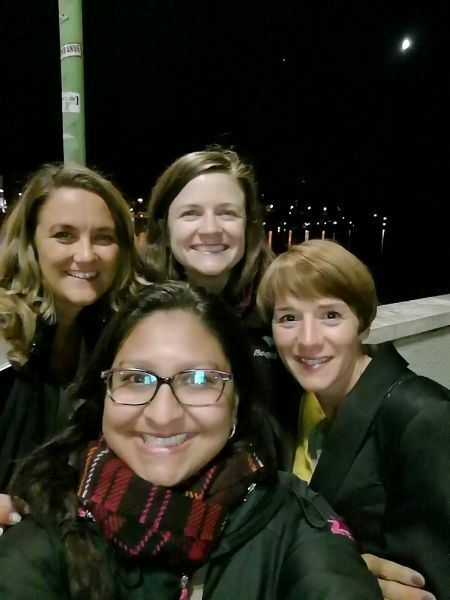 Jenny, a Heidelberg IWC Member, told us a little bit about her and her journey to starting a nonprofit organization in northern Cambodia helping children get an education. She is an Italian American who grew up in Switzerland, and after spending a few years in Thailand, she moved to Cambodia to work with a local NGO supporting women and girls with HIV/AIDS in Battambang, near the Thai border. Though she was working with these women and children in the community, there was still a lower class of children she calls the “invisible” children. They are so poor and vulnerable that even many groups don’t want to engage with them at all. After spending two years there, she had to make the decision whether to return back to Europe and find a “normal” job or stay and continue the work she was actively engaged in. With her friend, Andrew Wolff, they wanted to set up a nonprofit to support other nonprofits and organizations working in the community. However, after doing research on these groups, they realized they couldn’t in good faith support them with their time, expertise or money. Therefore, they started their own nonprofit, Children’s Future International (CFI), to work with the most vulnerable children and families in their adopted home. Jenny told us how the organization supports over 270 children and their families, with not only education, but housing security, agricultural support, and emergency intervention when a child goes missing (most likely trafficked into child labor or prostitution). Their social worker staff works with the children individually, and she shared with us multiple success stories of children who have been brought into their system and are graduating at school and thriving in life. Many of them come back to CFI as interns and want to continue doing work in their community. As for the future, Jenny sees their growing network and influence in the community, region and nationally as the key to sustainable support for the children of Cambodia. Thank you Jenny! Your wonderful talk and beautiful photos conveyed the passion you have for your work. We look forward to supporting you and the children you work with! Braving sub-zero temperatures and high winds, about 15 people gathered for the Heidelberg IWC’s 2nd Monthly Meeting. With about half members and half guests, the atmosphere was friendly and warm and a lot was discussed. Founder Christine Funke opened the Meeting with her ideas and hopes for the Club and then gave some important updates and news for the guests and members. Most notably, the Club will be applying for official association (eingetragener Verein) status in the coming weeks. This will legitimize the Club and allow the Board to open a Club bank account and get insurance for member activities. Additionally, the HIWC will be joining FAWCO, an international federation of independent women’s clubs and groups all around the world. There is a lot happening with this Club! After the updates, the guest speaker, Juliah Rais-Morres, gave her talk about her life living abroad, her work and passion for cooking, and her latest venture, Cooking for HOPE. She left Malaysia at 18 to study landscape architecture in the US, and after meeting her now-German husband there (he was an exchange student at the same university) and not feeling the same back at home, she moved to Germany where she has been for over 28 years. She noted her homesickness when first leaving home and the complicated life of living outside your home country, which many HIWC Members can relate to. In Germany as a side business, she started catering Malaysian cuisine for events. She opened a successful Malaysian restaurant, Serai, and when she decided to close it she started looking for ways combine her passion for food with helping the refugees who were flooding into Germany. At the same time, her son was on an around-the-world trip and she wondered daily, what is he eating? And does he have enough to eat? These two things encouraged her to start Cooking for HOPE to engage with and look after unaccompanied refugee minors, mostly boys, who have settled in Germany. With Cooking for HOPE, she gets the boys involved in cooking for events, teaches them how to cook for themselves, and takes them out for activities or day trips. They celebrate birthdays together, go bowling, cook lunches for refugees, and visit art exhibitions. She wants them to know that there is someone here in Germany who cares about them and is looking out for them. She encourages them to work hard to learn German and try hard in school so that they may be able to earn a residence permit to stay in Germany after they turn 18. Juliah has become like a mother to them, many who don’t have any family back home. Through food, drink, money and utensil donations from charities and groups in the community, Juliah plans to continue to work with these young boys and be a guiding force in their lives. Attendees at the Meeting were engaged, asked questions and showed interest in volunteering their own time and resources towards Cooking for HOPE. This seems like the beginning of a new cooperative effort in this region. After Juliah’s talk and slide presentation with photos from the events and activities, attendees chatted, enjoyed homemade food and drinks and then wrapped up the Meeting. It was a cozy evening on a cold winter day that brought lots of hope to all who attended. Thank you again, Juliah, for coming to speak to us! 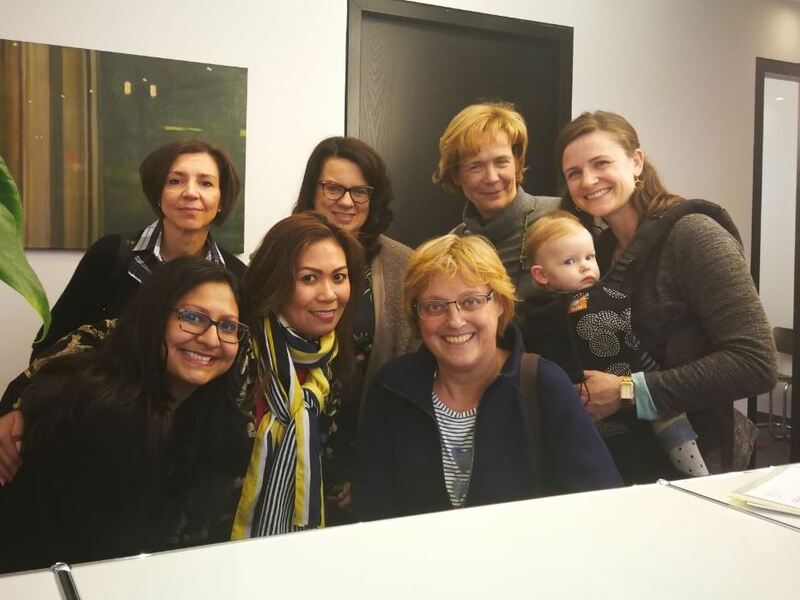 The Heidelberg International Women’s Club started off 2018 with a successful first Monthly Meeting, the regular get-together for members and guests interested to learn more about the Club. It’s held monthly, alternating evenings and mornings to appeal to the wide demographics of women who are members of the Heidelberg IWC. 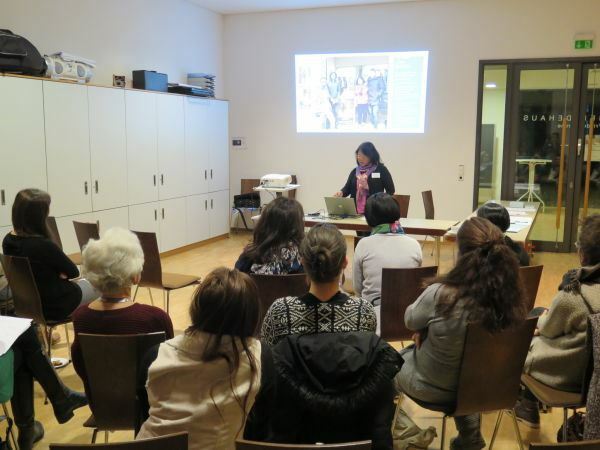 Taking place at the Peace Church in Handschuhsheim, about 15 attendees gathered to hear from the Club Founder, Christine Funke, and guest speakers, and spend time chatting about the Club and getting to know one another. Christine started off the morning with a short introduction to the Club, her vision for how the Club will grow, and how attendees can become members and get involved. 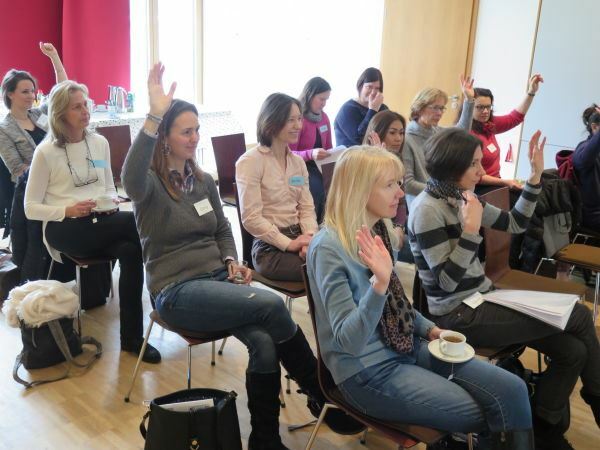 Next, guest speakers Silke Stevermüer and Andrea Scheuermann from the nonprofit organization Miteindander in der VG Freinsheim e.V. gave a 40 minute talk about their work over the past 3 years with refugees who are settled in their village on the Weinstrasse. Set up in 2015 during the high influx of refugees entering Germany, Andrea and Silke along with volunteers work directly with refugees to help with paperwork, appointments, setting up their apartments, getting children enrolled in school, giving language lessons, and hosting get-togethers for the refugees and members of the community. The refugees come from many different nations and have varied backgrounds of education, job skills and experiences fleeing their homes. As a special guest, a Syrian woman named Safa, attended with Silke and Andrea. She spoke in German about her experience in an apprenticeship in a school. She has learned German from scratch since arriving with her husband for four children, and has had to start over with a new skill set so that she can provide for her family. She was warm and friendly and spoke highly of the help she had received from Miteinander. It was interesting for attendees to learn about the type of activities the group hosts for the refugee community, how they teach them concepts like punctuality and women’s rights, and where their donations and volunteers come from. Silke and Andrea now have an office where people can come to them when they need help and they have various activities and groups to empower women and their families and help integrate the refugees into the education and job system. 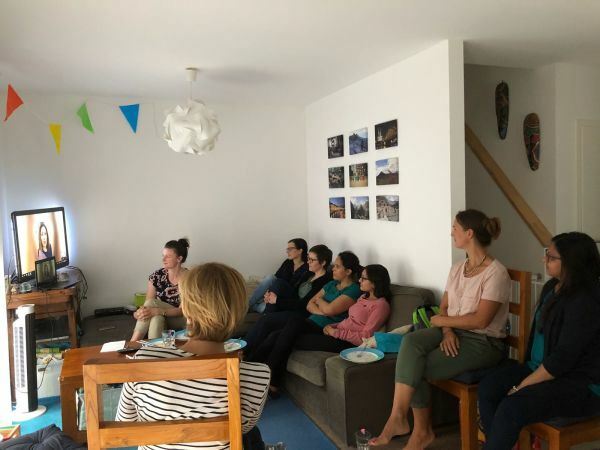 After this informative talk, attendees chatted about ideas for the Club, how to join, and found common ground among experiences abroad and living in Heidelberg and the surrounding region. 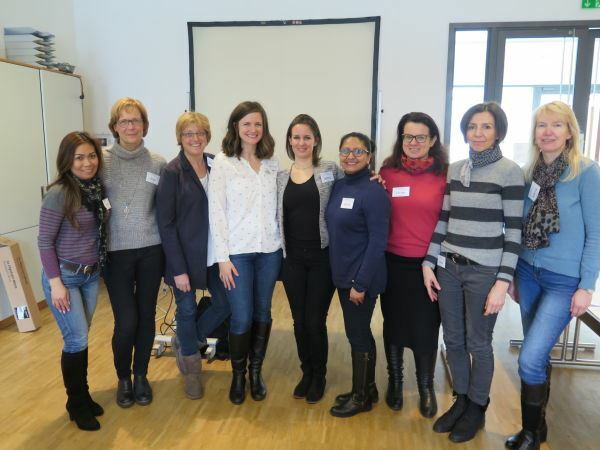 Overall, it was a success and great start for the Heidelberg International Women’s Club. A big thanks goes out to all the members who helped make it a wonderful event.